The first to reply was Hidden House Yoga. This studio, founded by an Australian teacher, Adam, is the new kid on the block in Chiang Mai after having opened just a year ago. It's located on the north east part of Old City where a cluster of backpacker establishments can also be found. The neighborhood is familiar since I stayed there during my first visit 2 years ago. 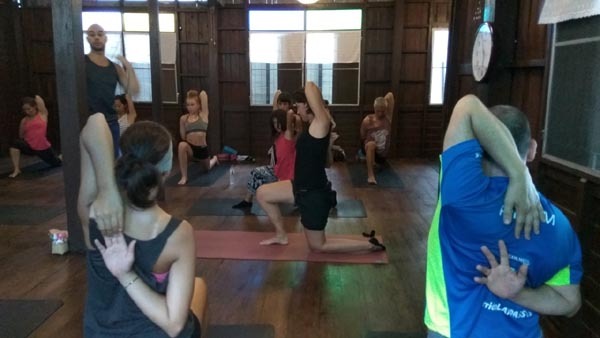 Adam conducted an Evening Yoga Flow to a packed house. There were 2 first-timers and some veteran practitioners - a daunting task for the teacher to keep everyone happy. The sequence was demanding and well articulated with a slow-enough cadence to sink into the pose. Some poses were held long enough and some kramas were repeated often enough to be challenging. Some asanas were creative - I haven't seen it done in any studio. I'm not sure if they were part of a yogic tradition or an Adam original - but they worked. The session left everyone with a smile - the knowing look that they faced up to a challenge and went the whole 9 yards with it. Job well done for everyone including Adam who masterfully orchestrated the sequence. Equally awesome was meeting the yogis who attended the class - residents, passing travelers, etc. Special mention to Selena who had a strong and enthusiastic practice - too bad she had to leave for Pai too soon. 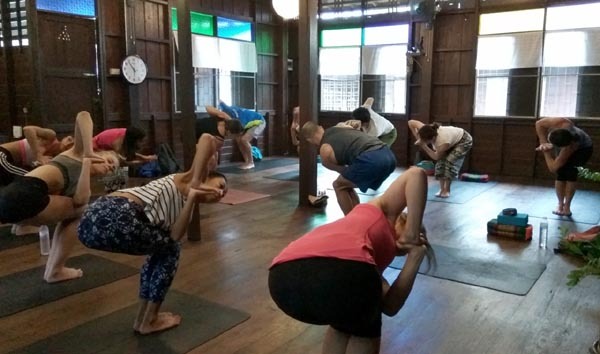 There are many yoga studios in Chiang Mai and there is even a Facebook page for Yoga In The Park - Chiang Mai. The community seems thriving here. Attending Adam's class is my start in what could become an immersion. Thank you Adam for having me on your class! (Aug 2, 2028) Thank you Gigit...see u in somewhere!